Description: Brand name: Eachine , Item name: 2.4g 6 axis RC quadcopter , Item no. 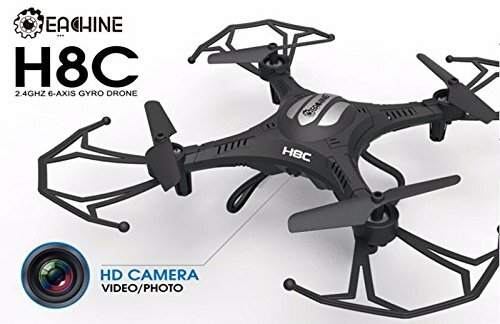 : H8C , Frequency: 2.4g , Gyro: 6 axis , Control distance: about 100m, Charger time: about 40mins , Flight time: 6-8mins , Battery: 3.7V 250mah(included) , Remote control: 4 x AA battery (not included), Quadcopter size:18cm*18cm*5.5cm , Certification: FCCROHSEMCEN71EN62115EN60825HR40406PASTMF963. Features: The 6-axis system allows the quad to be hand launched. 6-axis gyro quad-rotorcraft flight, strong stability, can easily implement various flight movements, stronger wind resistance, easier to control. 2.4g technology adopted for anti-interference.Even more than one quadcopter is flying at the same time they will not interfere with each other. The quadcopter can fly both indoor and outdoor.Including 4CH digital proportional RC system. Lightweight airframe with nice durability . It can realize 3D tumbling in four directions with 4 LED lights. Battery protection . Package included: 1 x Eachine H8C mini RC quadcopter (with camera). 1 x transmitter . 1 x battery . 1 x USB charging cable . 2 x replacement props . 1 x screwdriver . 1 x manual.